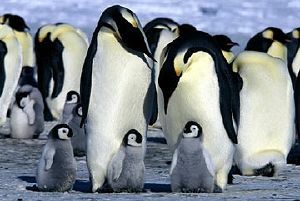 So perhaps it should not have been any great surprise that the documentary crowd pleaser of 2005 turned out to be a nature film, distributed by Warner Independent Pictures and funded by National Geographic, “as told by Morgan Freeman” and “based upon the story by Luc Jacquet”—whatever that means—that stars emperor penguins. What is surprising is how little we really knew about them, as well as how gorgeous the severely limited palette of Antarctica proved to be for the cameras. Nearly 4 feet in height and reaching a maximum weight of 75 to 90 pounds, emperors live up to 20 years and are the largest of the 17 species of penguins on the planet. They are of course flightless birds who live (and swim most swiftly and expertly) in the ocean, where they can hold their breath up to 15 minutes and dive as deep as 1700 feet. But “March of the Penguins” does not give us a rounded portrait of their entire life cycle. Rather, it focuses on the unbelievable exertions of the emperor’s reproductive season. In brief, these endearing, seemingly cuddly creatures waddle across the ice as far as 70 miles in a week, repeatedly (and they are not swift and expert walkers); stand for two months with an egg balanced on the top of their feet; go without any food for up to 125 days and lose as much as 1/2 of their total body weight; and do all this during the Antarctic winter, when temperatures range from a “balmy” minus 58 to more than minus 100 degrees Fahrenheit, daylight disappears for the entire 24-hour cycle, and storms can blow up to 100 mph. For this kind of work, penguin parents ought to be rewarded with a large brood of chicks, but each couple has only one shot per year: one egg for one tiny, spindly chick, not a few of which are lost before or after they hatch. Doesn’t this seem like a helluva way to raise a kid? Why go to all this trouble? Scientists believe the emperors didn’t always have it this hard. Millions of years ago, Antarctica was a temperate continent, much of which was covered by green jungles. (Fans of dinosaurs and TV documentaries will remember this, and a computer recreation of the verdant scene, from the fifth episode of the 2000 spectacular, “Walking With Dinosaurs.” See my review elsewhere on this site.) Continental drift and climate change forced almost everyone else out, but the emperors managed to adapt and hang on. “March” gives us a snapshot of Darwinian success at its most extreme. “March of the Penguins” alludes to this but makes no political hay out of it. And though the film quietly notes the multiple opportunities for failure in this lengthy process—stragglers on the march die off, a dropped egg is claimed by the ice, a leopard seal nails a mother in the water, some chicks freeze to death, and a large and feisty seagull apparently nabs a hatchling, though we are spared the climax—for the most part the film lets them keep their cute, funny, oddly endearing image. In fact (and many critics have chided it for this), “March” succeeds as a documentary pretty much in spite of its own forced cuteness and anthropomorphism. Freeman is given a script (credited to a third, separate writer—Jordan Roberts) that at times presumes far more than you would expect from a biologist like primary writer-director Jacquet . This is “a tale of survival, of life and death,” Freeman intones. “But it’s more than that. It’s a story of love.” True, the couples are “monogamous,” but only for one season. True, they bill and caress each other at mating time, but they spend most of their time separated—each caring for the egg or chick in turn, alone while the other forages—and then leave each other and the infant bird permanently to fend for themselves in the ocean and return to the group anonymity of the flock, once the chick is a few months old and can itself take to the water. Of the mild fights at the breeding ground between the females, who outnumber males, the narration cracks, “The men don’t seem to mind; they just wait for the fight to end, and take the opportunity to preen. They aren’t that different from us, really.” Uh, well, except for the 70-mile walk to get laid, and going without food for four months, and standing in a huddle of several thousand in an Antarctic blizzard with an egg-encased infant cradled on your arches, and. . . . The narration strains to heighten dramatic tension when there is already quite enough: the “brutal winter . . . will do everything in its power to destroy that egg”; the light starts to return after the dead black of winter, but “The worst is yet to come”; and when a winter storm nails several newborns, “The loss is unbearable.” In this last case, the footage of a mother poking at a tiny corpse and making a sort of moaning noise should have been enough to enable the viewer to draw his own conclusions. Still, Americans may have gotten off easy. Reports indicate the original French version of the film had multiple voices which render the supposed thoughts of the penguin themselves throughout the action! Interviews and text on the official Web site for the film suggest that maybe Jacquet and not Roberts (who wrote and directed the creditable “Around the Bend” with Christopher Walken and Michael Caine in 2004) is primarily to blame for the sentimentality and anthropomorphism. Gorgeous as the cool blue and burning white vistas of ice can be, and sweet and humorous as the antics of the waddling tenpins are, there’s a refreshing break when the mothers return to the ocean after the chicks have hatched. Suddenly, the birds turn into streaking bullets under the ice and waves, zipping across the screen as sleek and beautiful as any Starfighter. The camera nabs a few lovely shots of schools of fish, and a passing jelly. It is a reminder of how little we actually know about the lives of penguins—for one thing, they live in the ocean for four years after birth, before they are ready to head unerringly to the breeding ground—and about which we remain ignorant after the film concludes. Occasionally, the narration matches the dryness and somber majesty of its subject. A lone penguin who straggles behind the march “will fade away, absorbed by the great whiteness all around him.” When a leopard seal catches a mother who has returned to the ocean to tank up on food to take back to the breeding ground, it “takes two lives: that of the mother, and that of her unborn chick, who will never be fed.” An egg claimed by the cold slowly cracks open to reveal an interior of shiny ice crystals that offers a mere hint of X-Files horror. On occasion, nature itself serves a bittersweet mix of droll pathos: a bereaved mother tries to steal someone else’s chick and the group browbeats her back into line. During the credits, the film treats us to inset clips of the orange-suited film crew lugging equipment, greeting curious penguins, and peering through lenses on the ice. They even attach a camera to a balloon for a not-terribly-rewarding aerial shot of the colony. On the heels of so much pristine white, blue, and black, these sequences made me wonder what sort of inroads human civilization has made on the white continent, in terms of trash and industrial pollution. The film does not say, but the official Web site notes a few possible signs of global warming’s threat beyond the ozone hole and the huge, Rhode Island-size iceberg that made the news in recent years. In 2001 two giant icebergs calved in the Ross Sea and blocked off colonies of Adélie penguins, forcing them to make a 30-mile detour for food. Ice shelf melt that same year dumped emperor penguin chicks in the ocean before they were old enough to swim and they drowned. If a viewer cared to think much beyond the charm and wonder served up by “March of the Penguins,” the scary end-point must be the question: Could we adapt to such extreme conditions if the worldwide climate changes drastically—in the other direction—on us? Because of us? The short and only answer is of course no. Penguins had centuries—nay, millennia—to adapt to minute changes in conditions that only in retrospect seem drastic. Odds are that we have not given ourselves or the planet that wide a margin. A much smaller question is, how come the French have been making all the killer feature documentaries that consist solely of animal stars (e.g., “Microcosmos,” “Winged Migration,” and now this) of late? I recently saw this film (March of the Penguins) and thought it was most enjoyable to watch. It warrants the greatest admiration for these beautiful birds in their struggle to survive and care for their partners and young. I see them as a most courageous and proud species in the harshest of conditions. I hope their ‘tribes’ live on forever. I Like the movie happy feet! I meant to write alexandra as my name! Wow, fantastic blog layout! How long have you been blogging for? you make blogging look easy. The overall look of your site is excellent, let alone the content!. Thanks For Your article about March of the Penguins | Documentary Films .NET . Wow, marvelous blog layout! How long have you been blogging for? you made blogging look easy. The overall look of your web site is great, let alone the content!. Thanks For Your article about March of the Penguins | Documentary Films .NET . Wow, incredible blog layout! How long have you been blogging for? you make blogging look easy. The overall look of your website is fantastic, let alone the content!. Thanks For Your article about Documentary Films .NET » Blog Archive March of the Penguins | Documentary Films .NET . I together with my friends were reading the excellent recommendations located on your site and immediately I had an awful feeling I had not expressed respect to the web blog owner for those secrets. These women became stimulated to study all of them and have without a doubt been tapping into those things. We appreciate you turning out to be so considerate and then for pick out some useful issues most people are really desperate to understand about. My personal honest apologies for not expressing appreciation to you sooner.